Keira Knightley celebrated her Broadway opening night of ‘Therese Raquin’ at Studio 54 on Thursday (October 29) in New York City. 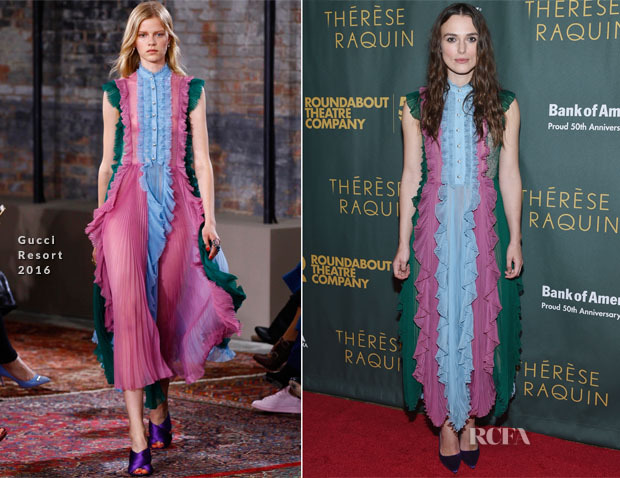 The actress changed a habit of a lifetime when she donned this Gucci Resort 2016 tri-colour silk chiffon ruffled and pleated dress styled with purple pumps. What was vibrant and electrifying in movement on the runway, became a tad frumpy and overwhelming when stationary off the runway. The pleats between the ruffles were the undeniable factor in bringing this look alive.